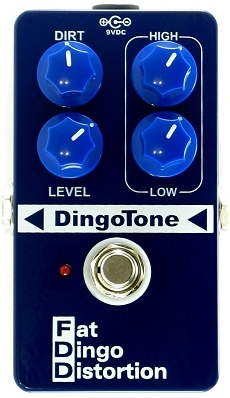 The Dingotone Fat Dingo Distortion pedal is a workhorse distortion pedal. Playing the Fat Dingo is like standing in front of a well balanced tube amp stack. Notes and chords feel great and cut right through! And the high and low EQ and huge boost give you maximum control. Perfect for playing covers and originals, the FDD has the flexibility to be your go-to distortion on stage, in the studio and in the basement. It is a tiny box full of great tone!